I’m not sure what to write about today. I’ve been dealing with a health matter and hadn’t been blogging much. My contract at Beliefnet is up, where I had my Tarot column. And I’m wondering where to go, exactly, with my writing here. None of that delights me. Well, this DOES seem like a good question for the cards. I feel like I need direction. Okay, Tarot: in what direction shall I roam here? 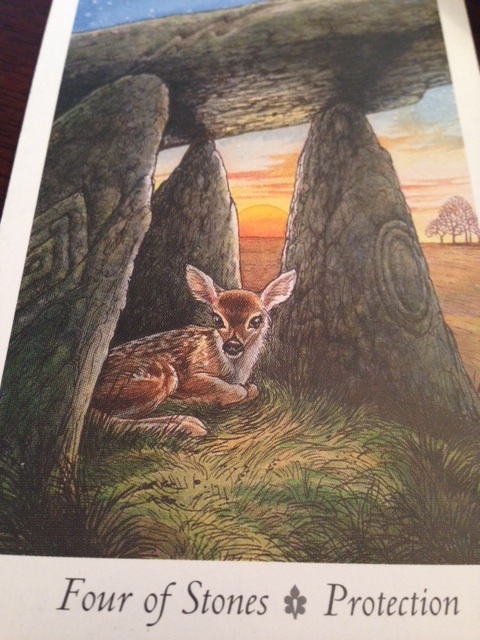 And a very interesting card from the Wild Wood Tarot is here — the Four of Stones (Protection). Element of Earth. She ain’t roaming! Thinking of the Four of Pentacles in the Rider-Waite: he who has. She who has. God bless the child that’s got his own. Security. Stability. Quite a powerful card really. She holds the cards. She has it. Although I often see it as “withholding” in romance spreads. Someone not giving. Someone not giving but someone HAS. In this incredible card, our creature deer is clearly protected, peacefully surrounded but open enough so that we can see her. We see her. Starry sky. Ears alert. She is wide awake. Can we connect this to the astrology of the moment? I think so. Sun and Mars are in solid stubborn hold-onto-them Taurus, an earth sign. Shelter from storm, roof above your head. Even if you’re the outside lost baby deer faun cotton creature, you are safe. And Venus yes doth enter (keyword) PROTECTIVE Cancer tomorrow 🙂 fiercely protective. DON’T YOU DARE TRY TO HARM anyone who belongs to a Cancer Venus or risk Mama’s dangerous ire. How this answers the question of what direction my blog should go in is a mystery to me at the moment but I’ll leave the card on my desk here and let you know… but bottom line about the Four of Stones: it’s okay to stay where you are. It’s okay to be where you are. Right there. It will be Gemini Season soon enough and we’ll start flying. Mercury will go retrograde in Gemini (on May 18th) and we’ll start flying — backwards! Oof!